My ultimate goal is to have my very own family knitting and craft guild and I think I'm well on my way! More power to you!! My grandmother started me out with simple embroidery projects like that, then moved me into quilt blocks (I loved making yo-yo's for example), then sewing for my dolls, and I have never looked back. She taught my brother to embroider, too, and I remember him drawing a race car and doing it all up colorfully. She then turned it into a small pillow for him. He was so proud of that. I am so happy for you AND your granddaughter! 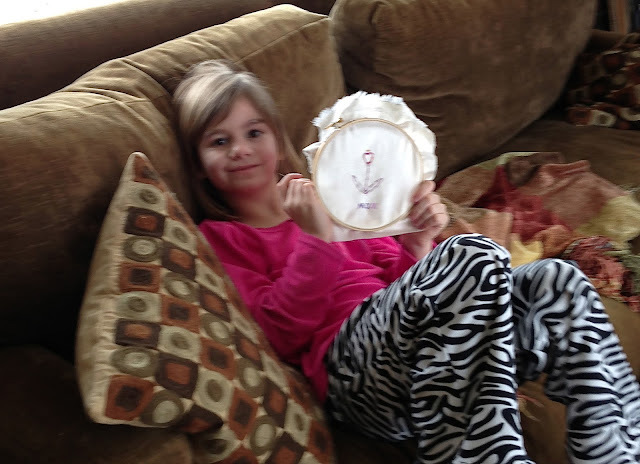 How wonderful that Mia loves to do needle work!! It's something that'll stay with her for life! What a good nana. One of my grand daughters was interested in knitting and then got very busy with school, basketball, etc. and didn't have the time. Recently, she broke her foot and has to sit out the season. She told me the other day that she got out her knitting, but her sister lost one of her "sticks." Don't you just love them!?!? Great idea! I tried to get Tara started with a cross stitch kit and it was too difficult and she gave up : (. I might try again following your example. What a cute post. You've given me some hope for the future too. I tried to "indoctrinate" my daughter into the joys of crafty, but it just never "took." She does love to cook, as her dad and I do, so we were halfway successful, but maybe I can look forward to a granddaughter of the future getting my "crafty" gene.